Assessing the need before conducting any training on participatory forest management and conservation through bee keeping project in semi-arid regions of Tanzania. 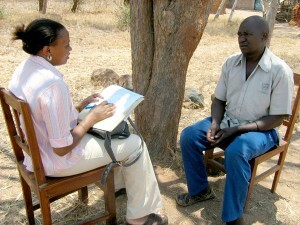 I work as assistant lecturer at Sokoine University of Agriculture, teaching environmental toxicology and safety practices courses to undergraduate students. Before that, I had an opportunity to work with a NGO on environment and gender activities, where we had a lot of gender campaigns on resource management, awareness raising and training on conservation farming and environment management programs. Currently I am on study leave for my PhD research at Leuphana University of Luneburg in Germany in collaboration with Ecotox research group of Hamburg University of Applied Sciences. My research involves the conceptual framework and critical assessment of the impact of the recently announced agricultural and poverty alleviation policies in attracting large scale agricultural investments in the Kilombeo Valley, Ramsar wetland. The question of wise use and sustainability of this wetland of national, local and international importance will be addressed. The idea in the long run is to encourage policy makers to establish the management plan for this Ramsar site which was designated in 2002, but no management plan has been put in place yet. Rather than simply lecturing in class, I normally strive to cultivate an interactive learning environment in which students can express themselves freely while learning to engage with the past in meaningful ways. I emphasize critical thinking and the need to consider environment within its large scientific, social, historical and intellectual contexts. I believe that it is only through disseminating proper knowledge and skills to the young generation that will lead to the sustainable change of environmental management and conservation, especially in developing countries where majority have inadequate education and poverty levels are high. I am a young academician, researcher and a motivated female who has been working in the area of risk assessments and environmental management for more than 5 years. Now working towards my PhD on sustainable wetlands management, I believe it is the role of both policy makers and local community to impose laws and invent socio-economic activities that will prevent further degradation of the environment. After my PhD research, I will return home and take over my positions in the Faculty of Science, for teaching, research and consultancy work. I expect to communicate the results of my study to the key stakeholders, farmers, policy makers and local community for awareness raising and dangers related to extensive pesticide use in these wetlands. I also envisage proceeding with further research in wetlands management, and raising recommendations for wetland policy formulation for sustainability and wise use of other wetland ecosystems in Tanzania. Silvia is working with Fassil Gebeyehu (2011), Girma Mensuro (2012), Temegsen Olango (2013) and Nickson Otieno (2011) and various GESA resource people to organise the Global Environments Regional Academy – East Africa funded by the Alumni Innovation Fund. 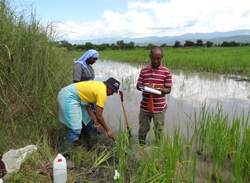 Sampling during rainy season: Assessments of pesticide residues in the rice plantations of the Kilombero Ramsar site ecosystem. 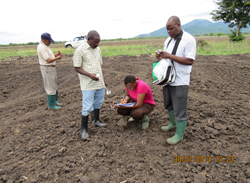 Assessing soil features and sample collection in the bare sugarcane farms for bioassays and pesticide analysis. 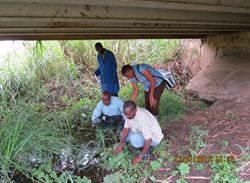 Sediment and water sampling in contaminated streams of sugarcane plantations, in Kilombero Ramsar site, Tanzania.